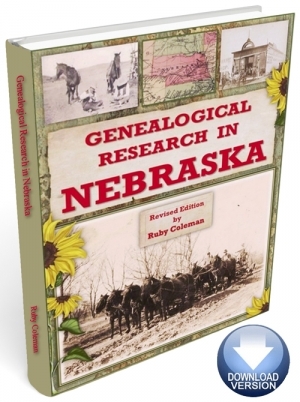 Everything you need to know about doing genealogical research in Nebraska! It contains historical and geographical information, plus information for each county in the state. There are hundreds of URLs that will link to web pages that are a must when doing genealogical research. Some of the topics ... Trails, Road and Forts; Ethnic Groups; Land Laws and Records; Institutional Records in Nebraska and Farming and Ranching Records.